Come and travel on an unforgettable journey that will make the scriptures come alive. This is a unique tour you may not have seen offered before because in addition to seeing all the inspirational and historic sites you would want to see on a visit to the Holy Land, we are taking you to some places we find fun and unforgettable–places that most tour groups don’t get to go. After so much time in the Holy Land, we found some things we think are “not-to-be-missed” that most miss. And please consider adding the exciting Egypt Pre-Tour to your adventure. Egypt is one of the most unique places on earth and this is the first time we have taken groups there for about 10 years! Please see the flyer for Egypt! *A visit to Nazareth Village to see what 1st century Nazareth looked like. Sunday, April 10 and Monday, April 11 — Day 1 – 2 Trans-Atlantic flight to Amman, Jordan. Arrive at our lovely hotel and receive a welcome and attend out group orientation. Get a good night’s rest tonight! Day 4 – Drive to Wadi Rum, associated with Lawrence of Arabia, where we will four-wheel out into the desert to see one of the most impressive desert landscapes in the world. The scenery here is almost beyond imagination! We then cross the border into Israel at Eilat and begin our journey north towards the Dead Sea. Here we stop at the ancient Timna Valley copper mines, which Nephi would have known, and see and tour the impressive Tabernacle in the Wilderness, which is a replica of the center of worship for Moses and the Children of Israel. Later this afternoon we float in the Dead Sea and demonstrate how you can do perfect water ballet without sinking! Stay that evening at the base of impressive Masada. Day 5 – Sunrise hike up Masada. (It’s easy, but a Gondola is also available.) There’s nothing like seeing that sunrise over the Dead Sea. Masada was one of Herod’s grand palaces, but also the last stand of the Jewish resistance when they were overrun by the Romans in 73 AD. We visit Qumran where the Dead Sea Scrolls were discovered, then drive through the wilderness of Judea to Jesus’s baptismal site on the Jordan River then past Jericho and the Mt. of Temptation. This afternoon we are reminded how the Romans lived during Jesus’ time as we visit Beit Shean, impressive Roman city, which was one of the Decapolis where Christ’s apostles preached. Stay tonight by the Sea of Galilee. Day 6 – Today we walk where Jesus walked in the Valley of the Doves, followed by a visit to the Mt. of Beatitudes where He gave his Sermon on the Mount and you will be able to see how he could address so many people at once. This is always a highlight of the tour. Then it is on to Banias, a place of natural beauty and a cascading waterfall. We come to the origins of the Jordan River. This is also the site of Caesarea Philippi, where Peter declared that Christ was the “Son of the living God.” We will also see Mt. Hermon, a candidate for the Mt. of Transfiguration. Time permitting, during the late afternoon light, we will go to the top of Mt. Arbel, a place so beautiful we made it the cover of one of our books, and show you a very sacred place in the life of the Savior. Overnight again by the Sea of Galilee. Day 7 – In first light we sail today where Jesus walked on the Sea of Galilee. We stop by the Boat Museum, to see a boat that was discovered from the time of Jesus. Then it is on to the town where Peter lived and where Jesus ministered for three years, Capernaum. Here Christ performed so many miracles and taught in the synagogue. You can close your eyes and almost be in the scene at the healing of the daughter of Jairus. At St. Peter’s Primacy on the Galilee we remember both the miracle of the loaves and the fishes and also the resurrected Jesus preparing fish on the seashore for his hungry apostles. We will eat St. Peter’s fish today. Our last night by the Sea of Galilee. Day 8 – We are on to Nazareth today, first to Mt. Precipice overlooking the Jezreel Valley. When the people of Nazareth rejected the Savior, this is where they tried to kill him. Below is also the scene of the last battle of Armageddon and to the east Mt. Tabor, another candidate for the Mt of Transfiguration. Then it is on to one of our favorite stops, Nazareth Village where you see what Nazareth would have looked like in the time of Christ, including villagers and shepherds who are dressed up as in the period to enhance the scene. Then it is on to the breathtaking Mt. Carmel where Elijah had his showdown with the priests of Ba’al. Finally we go to Caesarea Maritima, which was once a grand Roman city with a beautiful aqueduct that is still standing. It is also the site of Paul’s trial before King Agrippa. We stay tonight (for four nights) in Jerusalem. Day 9 – This morning we visit Yad Vashem, the vivid Holocaust museum, followed by a visit to the Dead Sea Scrolls Museum, and the Second Temple Model of Jerusalem. This gives you a picture of what Jerusalem once looked like and helps you understand today’s layout. Then it is on to Bethlehem where we will have a special lunch in a Tent Restaurant. At Shepherd’s Fields we celebrate Christmas once again and then go to the Church of the Nativity which has been standing since 339 AD over a cave where many believe Christ was born. Day 10 – Arise early because we are going to the Temple Mount, a sacred place to Jews, Muslims and Christians, a place some believe is the very origin of creation. We will see the Dome of the Rock, Al Aqsa mosque and more. Then we go to the Pool of Bethesda, where Christ healed a paralytic man and to St. Anne’s Church where the acoustics make us all sound like angels when we sing. We will stop at Pilate’s Judgment Hall, Chapel of Flagellation and show you where Antonia’s Fortress was that housed the Roman soldiers who scourged Christ. We then follow the Via Dolorosa (the way of the Cross) to the Church of the Holy Sepulchre, the site believed by many Christians to be where Christ was crucified and resurrected. Free time until dinner. This evening we will visit Jimmy’s olive wood shop, a favorite with Latter-day Saints, because he has so many Mormon-specific carvings. Day 11 – Antiquities Day! This is a favorite since you will do things you would never get to do. We begin on Mt. Scopus, just below the BYU Jerusalem Center, working with archaeologists to sift some layers of material that came from the Temple Mount looking for shards, pottery, coins etc. You will feel like an explorer and a treasure hunter all at once. Then we head to the Archaeological Park that is part of the temple complex where you will learn about the temple Jesus knew and walked on the very steps he walked on that once led into the temple. From here we go to the Western Wall, where you will see Jews praying at their holy place. Finally, Joseph Zanbil, an antiquities dealer will teach us about the antiquities of Israel—how he has found them and what they are. Free time to explore the Old City on your own. Day 12 – Our last day in the Holy Land is the highlight of the tour. We start in the Upper Room, believed to have been built on the site of the Last Supper, then move to the Church of St. Peter in Gallicantu, built on Caiaphas’s palace where Jesus was tried. Then we go to the BYU Jerusalem Center for a tour, then on to the Garden of Gethsemane, the Church of All Nations and the Orson Hyde Gardens, where we will discuss the sacred events that happened here. 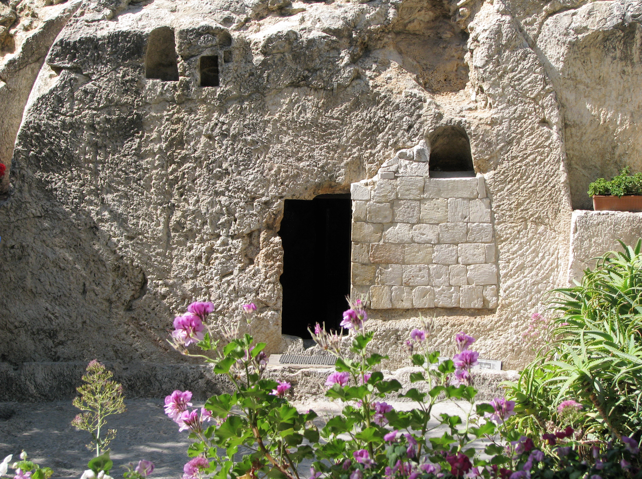 Our tour is capped with a visit to the Garden Tomb where we will remember that “He is not here for he has risen.” Here will have a testimony meeting. We end with our final feast together and go on to the airport. Day 13 – Trans-Atlantic flight and arrive home. The cost of the Holy Land portion of the trip is $2,400. Entrance fees: Petra, Jeep in Wadi Rum (2 hours), Timna Park includes tabernacle, Masada by foot (No cable car included), Qumran, Beit Shean, Banias, Boat ride on the Sea of Galilee, ancient boat museum, Mt. Arbel, Nazareth Village, Caesarea, Israel Museum, Yad Vashem, City of David include Archeological experience, Davidson center. All relevant churches in Galilee and Jerusalem. Our rate excludes: Expenses of a personal nature; meals and drinks other than mentioned above; Visa to Jordan if group stay 1 night only 60$ per person; R/T Airfare (Block pricing may be obtained from SLC). Again, please call Wendy at Morris Murdock Travel (Office: 801-483-5285) to book your reservation with a $500 deposit per person today. Places will go quickly. Be sure to ask about the exciting pre-tour excursion to Egypt! Come and see wonders of the world and witness marvelous relics of this ancient civilization. You can add the amazing Egypt trip for only $1,479. Call our agent, Wendy, for details: 801-483-5285.